Above - The Queen's Theatre, Paradise Street, Liverpool, formerly the Royal Colosseum - From 'Annals of the Liverpool Stage' by R J Broadbent 1908 - Courtesy Maurice Friedman, British Music hall Society. The Royal Colosseum Theatre and Music Hall, in Liverpool's Paradise Street opened in 1850 and was a conversion from a former Unitarian Chapel which was originally built in 1791 in the shape of an Octagon. The Unitarians left the building in 1849 and it was subsequently converted into a Theatre by the new owner, Joseph Heath who incorporated some of the original features into his new Theatre, including the chapel's old pews for seating. Right - A Poster for the new Grand Opera House, Liverpool for October the 19th 1896 - Courtesy Ian Cowell. Unusually, and possibly the first of it's kind, the Colosseum had two auditoria, one showing plays and the other, Variety. The Theatre closed when part of the ceiling fell down on the 11th of October 1878 which caused 37 people to be killed, and many injured, in their panic to escape the building. A year later the Theatre was reopened after extensive alterations and conversion into one auditorium which was stated to have been able to hold 3,000 people. However, this new incarnation was not very successful and the Theatre was bought by Dan Saunders who had been the manager of the Star Music Hall. He renamed the building after himself and the new Saunder's Theatre opened on the 26th of April 1880. The Theatre was renamed under new management in 1881 to the City Theatre of Varieties, and then later to the Grand Theatre which closed in 1894. 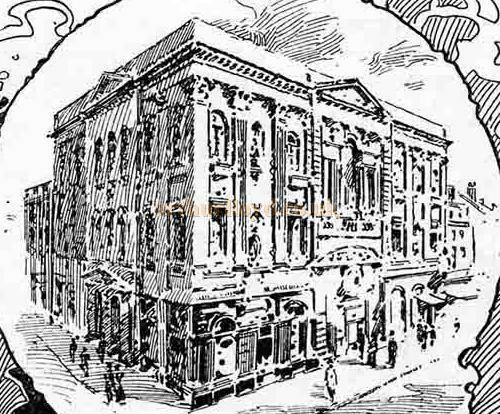 In 1895 on the 3rd of June, the Theatre reopened as the Grand Theatre and Opera House by its new owners, Joseph Heath's grandsons but was soon sold again, this time to Messrs Elliston and Machin for £18,000, who stayed in control until 1901. After this it was bought by T. Morton Powell but closed in December of 1903 and was mostly demolished the following year and almost completely rebuilt retaining only the original frontage and side walls. 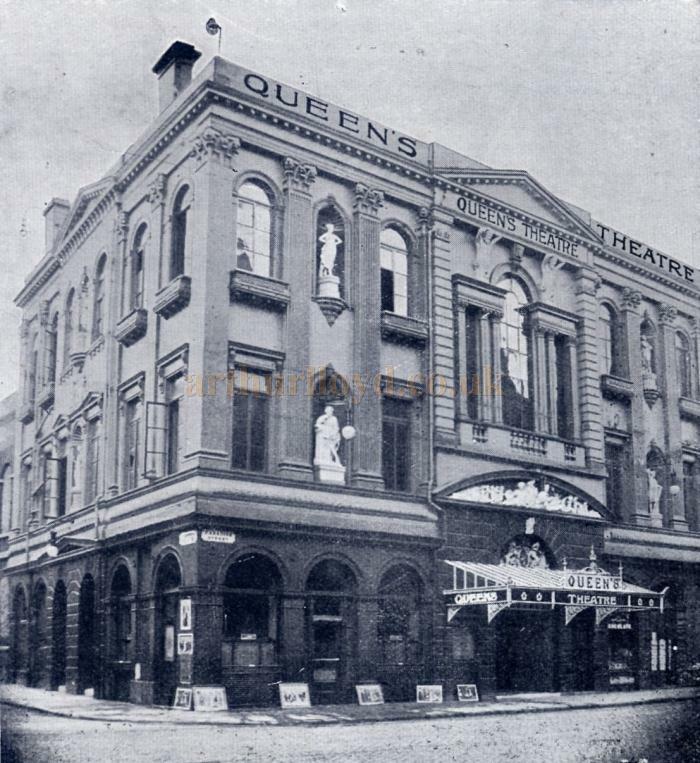 The Theatre reopened as the Queen's Theatre on Monday August Bank Holiday 1904 with a capacity of 2,000 in a more conventional form with a horseshoe circle and boxes, tip up seats, and all lit by electricity. Above - A Sketch of the Grand Opera House, Liverpool - From 'The Playgoer' of 1901 - Courtesy Iain Wotherspoon. 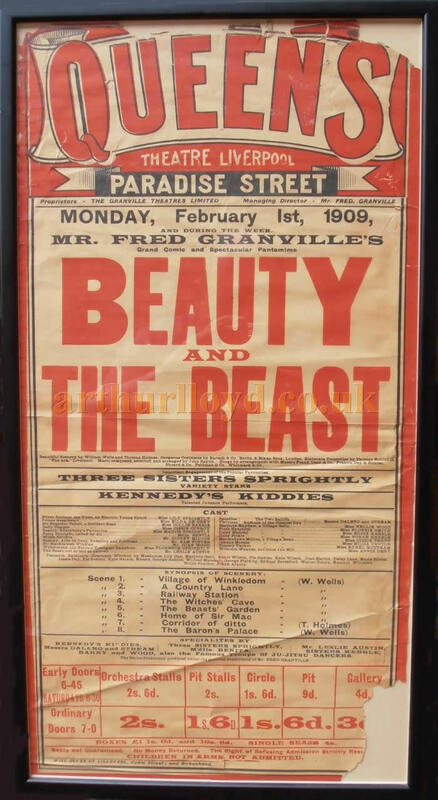 Above - A Poster for 'Beauty and The Beast' at the Queen's Theatre, Paradise Street, Liverpool for Monday February 1st, 1909 - Courtesy Nick Hughes - The Poster says that the Proprietors at the time were Granville Theatres Limited, and the production featured Lily Sprightly, Hilda De Grey, Dollie Harrie, Cissie Conroy, Maude Sprightly, Mdlle Benita, Sidney Milton, Sam Foster, Juan Wood, Florence Sprightly, Leslie Austin, Deleno and Stream, Nellie Wood, Florrie Smith, Eddie Kebble, Norah Kebble, Cissie Trent, Hilda Denton, Ethel Mottram, and Annie Dent. 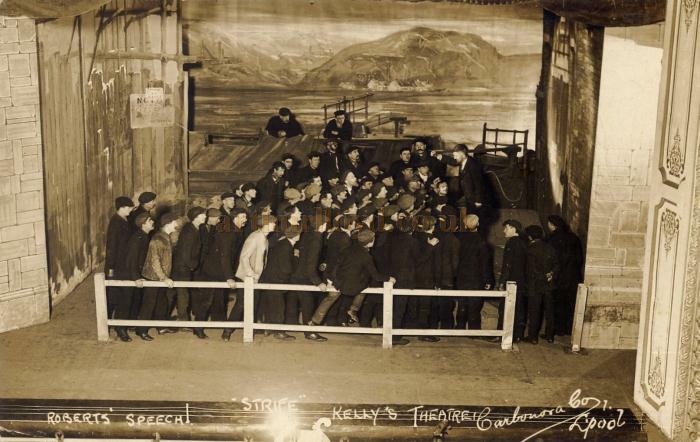 The Theatre only had a short life as the Queen's however, as a few years later it was bought by William Wallace Kelly who renamed it after himself as Kelly's Theatre. 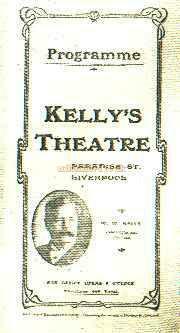 Kelly was also Lessee and Manager of the Shakespeare Theatre, Liverpool in 1914. 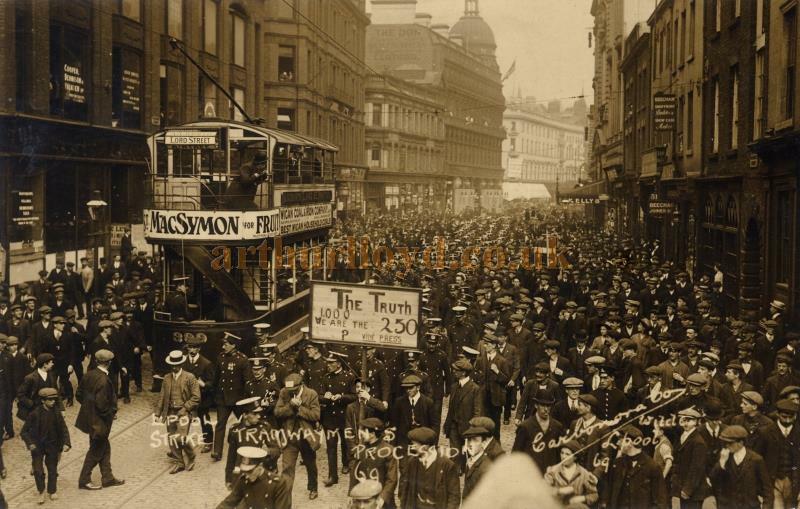 Above - A postcard showing a huge crowd of demonstrators in Paradise Street during the Liverpool Transport Strike of 1911 - Courtesy Maurice Friedman, British Music hall Society - Kelly's Theatre can be seen on the far right of the photograph. Above - A postcard depicting Robert's Speech in 'Strife' on stage at Kelly's Theatre, Liverpool - Courtesy Maurice Friedman, British Music hall Society. Kelly's Theatre was to be the last incarnation for this building as a Theatre and by October 1916 it had closed its doors for the last time. The building was subsequently used as a warehouse by Cooper's Ltd but was bombed during the Second World War and was then demolished. Right - A Programme for 'Sale by Auction' and 'Nan' at Kelly's Theatre, Liverpool, for the week of April 26th 1915 - Courtesy Roy Cross - Click to see the entire programme. In 'Memories of Show Business' by Percy G Court, 1953, he writes briefly on the Grand Opera House saying: 'From the Theatre Royal Aldershot we were to play at the Grand Opera House Liverpool and this theatre was in Paradise Street near the fish market, afterwards called Kellys Liverpool (now demolished by bombs). Liverpool in those days, was very prosperous. During my three weeks stay, I made the trip to New Brighton - visiting the world famous "egg and ham parade". I went by steamboat - six pence return. I should think it would be five or six miles each way. Liverpudlians seemed to sport themselves in their thousands, donning their gayest clothes (it was Sunday) even to having brass nails to adorn their footwear - clogs. Memories of Show Business by Percy G Court, 1953. 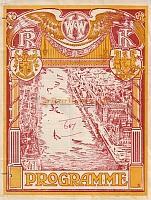 Left - A Programme for Kelly's Theatre, Paradise Street, Liverpool - Courtesy Alan Chudley.